﻿ Hybrid Arm Extraction Hose - Sentry Air Systems, Inc. 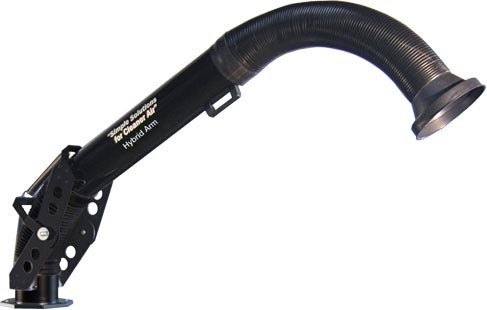 The heavy-duty Hybrid Arm is both a flexible and rigid hose designed to operate with the Sentry Air fume extractor model 500. The Hybrid Arm is a very useful fume extraction accessory that can easily transform your fume extraction equipment into a source-capture configuration, serve as ducting between two objects, or function as an exhaust hose. An upgrade from our Black Flex Sentry™, the Hybrid Arm is completely self-supportive and is designed with a rigid hinged segment. This segment of the arm provides mechanical support and the ability to hold any angle from vertical to 90 degrees without assistance. 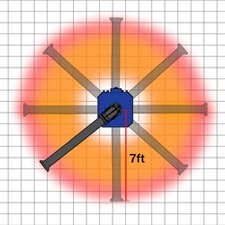 The flexible hose segment can be used to connect existing machine ports to fume extractors or mist collectors during applications such as CNC machining and laser etching. 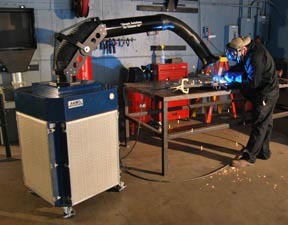 Like the Black Flex Sentry™, the Hybrid Arm can be used for high heat applications such as welding and soldering, as well as chemical fume control, light powder extraction, and a variety of other procedures performed in laboratory, manufacturing, construction, and medical industries. For complete fume extraction and air purification systems, please visit our Product Gallery page.